Velezita: Because My Fairy Blog Mother Said So, That's Why! Zombie Chickens?!?! This just might be the best award EVER! Awesome! You are awesome. Also, another thing that makes you awesome is the fact that you would make a funnel full of soup. The other day I thought that you could keep the soup from falling out by turning it upside down but that would just make it fall out faster. I was a little drunk. I can pick things up with my toes too!!! You are indeed one funny chicky. :)I love polling the kids via text. Isn't that so true these days? Congrats on the awards! Seriously? You make my day. 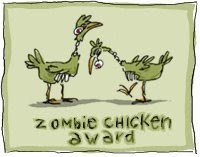 I have to say...i've never heard of the Zombie Chicken award. The kids get back to you yet? Good to know we are appreciated huh? UPDATE: Those kids STILL haven't given up the information. I'm pretty sure they wrote a screenplay and they are tracking down Reese Witherspoon to play me.